Good morning.....just a quick card today to show how you can use the lovely new Tonic Studios Rococo Christmas Tree die to make a Clean and Simple card for Christmas. I think it's ideal for times when you have lots of cards to make in a short space of time.. 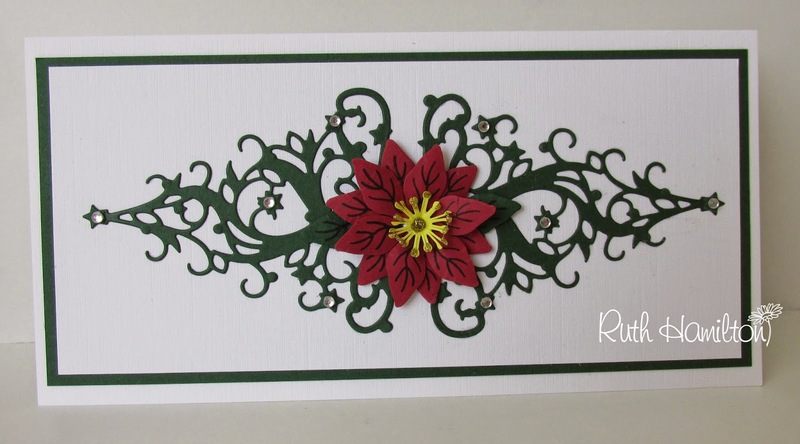 I've added a Poinsettia made with the Tonic Studios Clematis, Lily, Poinsettia Punch and Stamp set - also from Tonic Studios and some tiny gems. I've used white linen, forest green, ruby red and daffodil yellow card from Papermill.